Full Beam Master King + 2 Guest Queens that convert to Twins + 1 Twin, all with private bathroom. 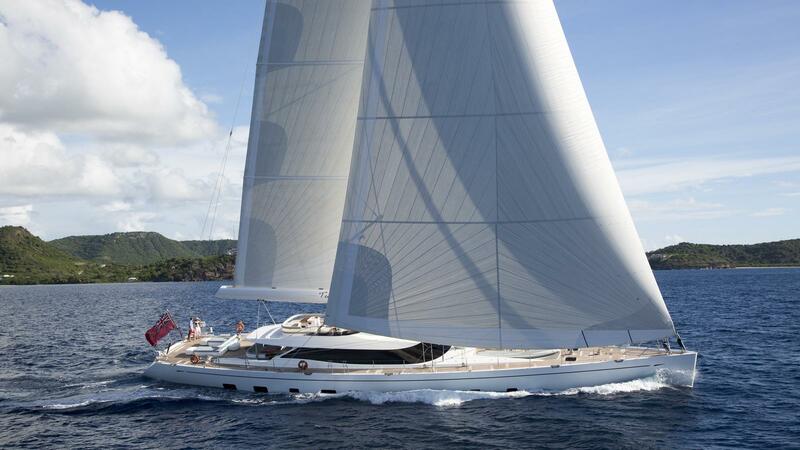 Available Summer 2017 from 1 June in Western and Eastern Mediterranean and Winter 2017-8 in the Caribbean, TWILIGHT is a 125′ flybridge sailing sloop, built in Turkey and launched in 2013. She is available for charter in the Western Med during June 2017, Croatia during July 2017 and in Turkey and Greece during August and September, 2017. 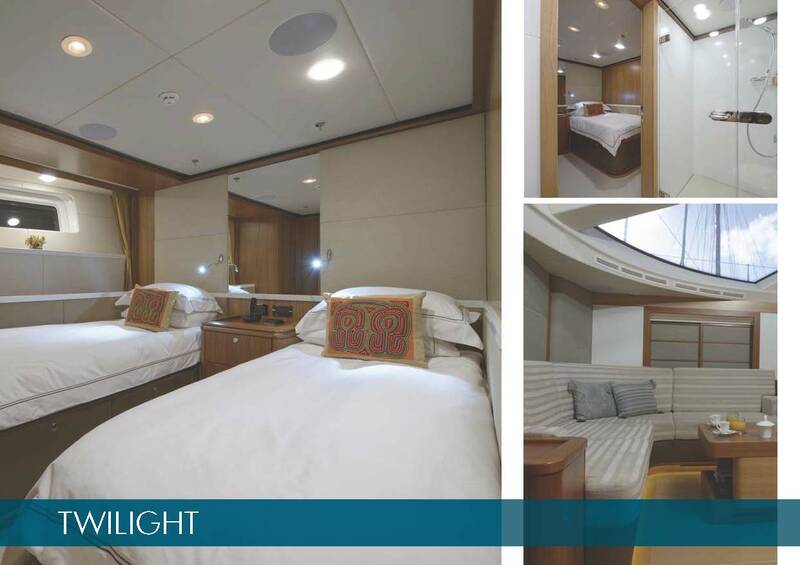 With naval architecture by Ed Dubois and interior design by Oyster Marine, she is Lloyds-classed and MCA compliant, accommodating eight guests in a full beam Master King aft, plus two guest Queens that convert to Twins amidships, plus one Guest Twin… Each cabin is spacious with lots of headroom and has its own ensuite bathroom. The owner uses TWILIGHT as a mother ship for a racing boat, so there are lots of single beds aboard, making the yacht ideal for families. The dining tables seat ten….. 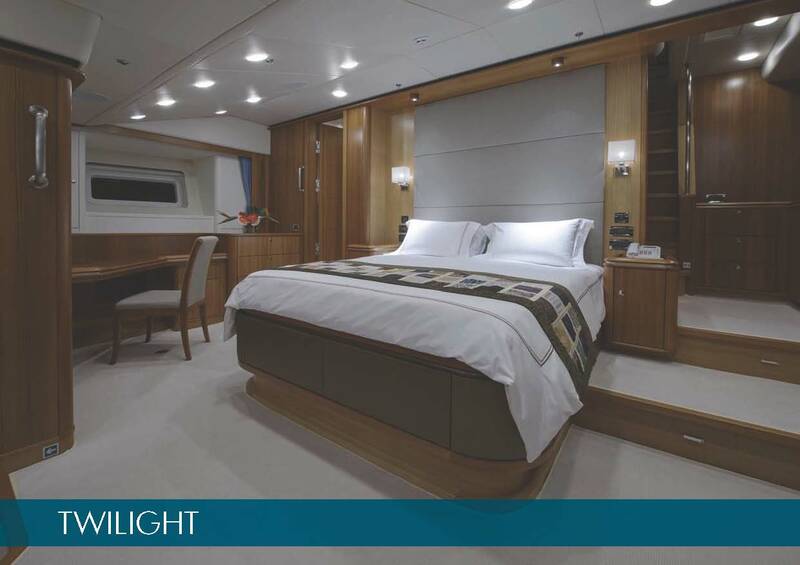 Attractively appointed, TWILIGHT’s split-level, deck saloon is modern and elegant with gorgeous solid-planked wood floors. There’s an upper saloon and a lower saloon, the upper saloon being larger with windows all about and has modern, minimalist appointments. 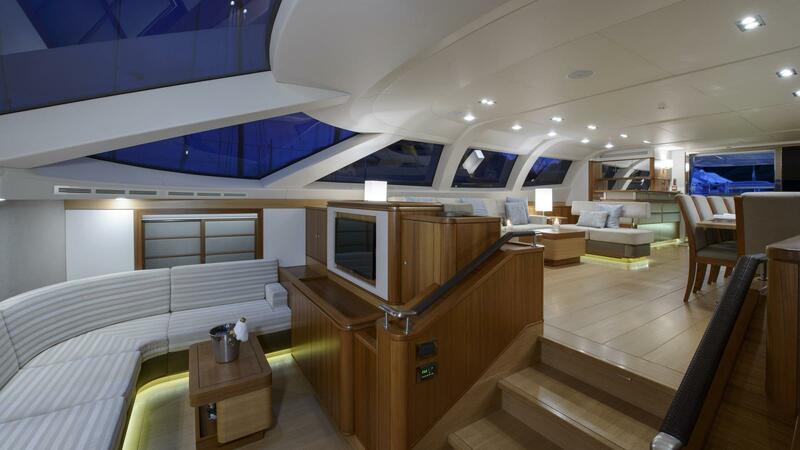 On the same level as the cockpit, the upper saloon functions as an indoor dining area, bar, and lounge, but the pilothouse cockpit, which it opens up to offers out of dining as well. 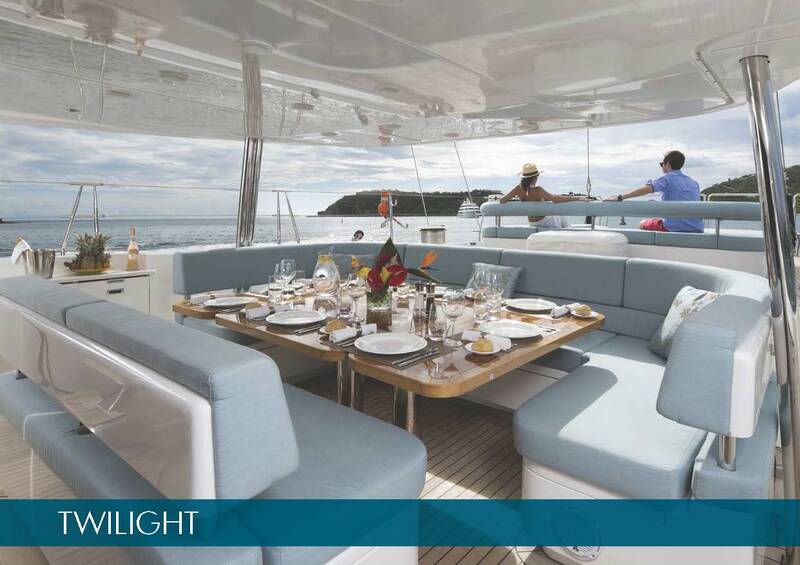 A flybridge on top of the upper saloon offers a second out of door dining option as well. 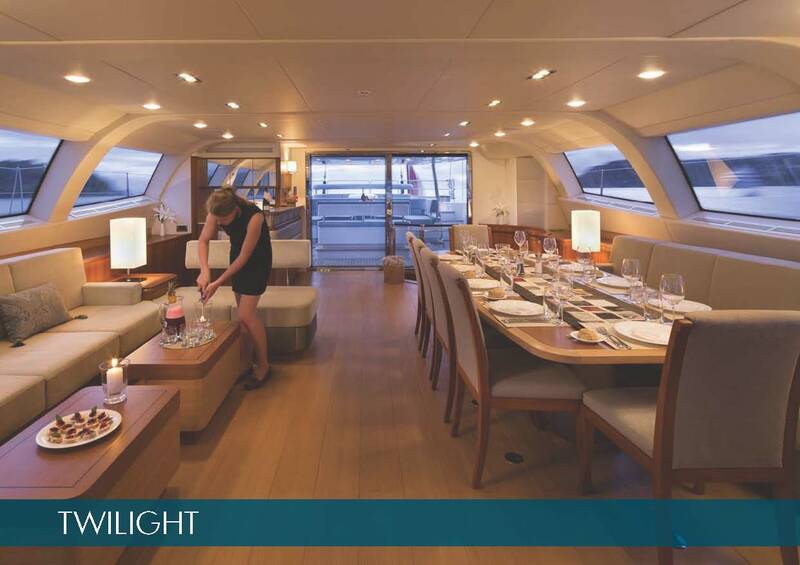 The lower saloon is used after dinner for watching television, which children find particularly useful… The crew adore children, and there are 2000 movies in the yacht’s Apple TVs. 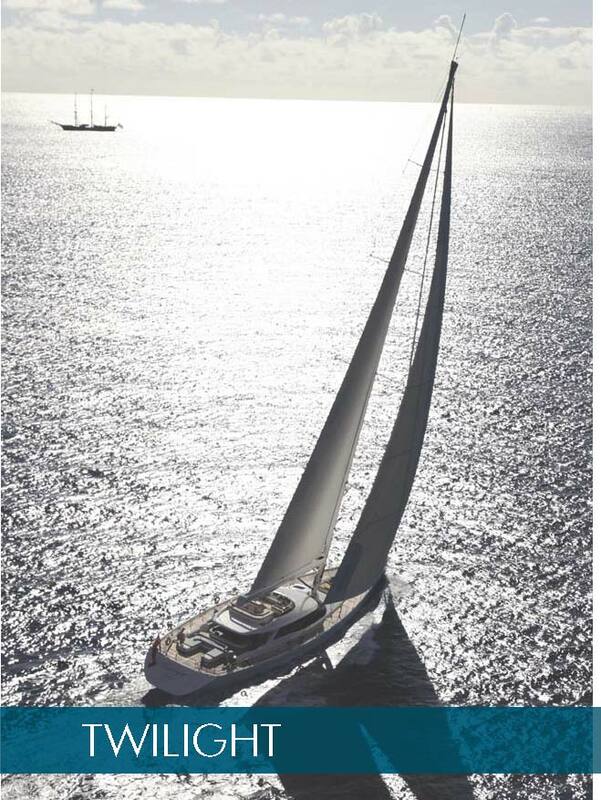 TWILIGHT has recently had an extensive refit to include a stunning dark blue hull, deck sun awnings, new interior furnishings and guest amenities.